Fes-al-Jdid nearly abuts Fes-al-Bali. It is old, but less so that Fes-al-Bali. It is a smaller area and seems to lack the coherence of its older cousin. It is, nonetheless, interesting in its own right. 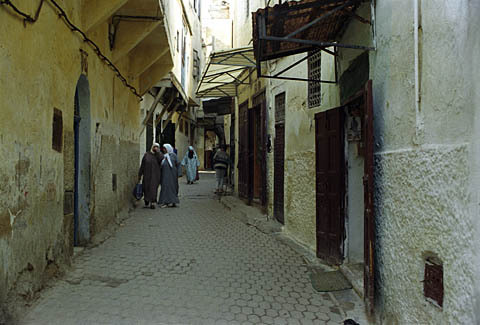 While the practice of "corbeling" (the extension of upper stories outward from the ground floor) is common in Fes-al-Bali, it is almost the norm in Fes-al-Jdid. The practice provides shady areas even at noon, and further reduces the glare of the sun in the narrow streets. The absence of ground-floor activity makes this street seem barren and unattractive. This is a common problem in parts of many, and the importance of ground-floor stores and offices cannot be over-emphasized. Modern buildings tend to be especially deficient in this respect, and it is not unusual to see blind façades of vast extent. They are normally covered in graffiti.